Small Business Saturday is Saturday, November 24, 2018 – Here are a few tips to help you get ready! Small Business Saturday is an opportunity for local businesses to gain visibility and bring more spending into local communities. Many shoppers see Small Business Saturday as a way to support their local community. 1. Plan ahead and get it done! If you don’t start now, before you know it, the event will be here and gone. 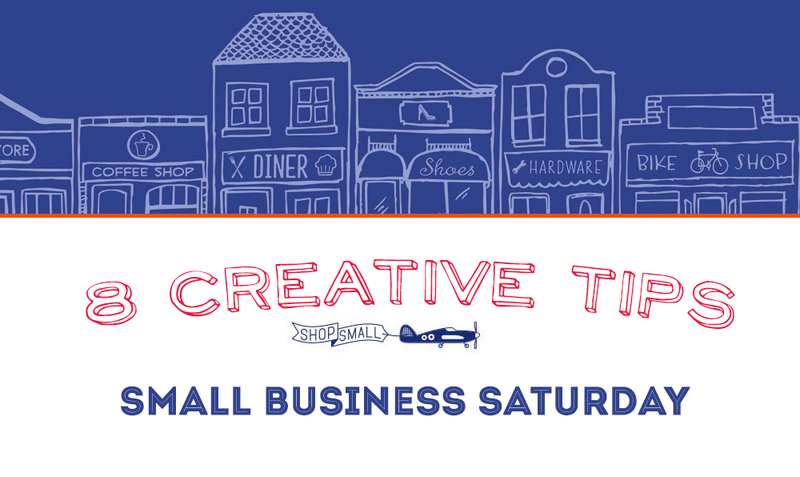 Since many communities are dialed into Small Business Saturday, now is the perfect time to do something. It doesn’t have to be perfect. But it can be effective and memorable. 2. Get your email list ready. Hopefully you have a list of customers and prospects that have shown interest in your product/services, or that have purchased from you. Through messaging and offers, set the expectation of what your visitors can expect weeks before… not the day before! Take the time to craft a message that is compelling and that brings to mind why your customers/prospects should visit you on Small Business Saturday. Keep in mind your audience. For instance, Millennials like to feel a connection to the products they buy, they appreciate a personalized shopping experience and customized products. Are Millennials your biggest fans? Find out more from Forbes. Don’t be a lone wolf! Reach out to the other businesses within your community to present a collaborate approach. Through combined offers that bring visibility not only to your location or service, but also to your brick and mortar neighbors and online ‘neighbors’, you can make your outreach stronger and one that engages your community. Along these lines, be generous with your re-tweets and social sharing. Bring attention to each other and their businesses through cross promotions on social media. Take the time to comment on each other’s posts! In addition, take digital cross promotions a step further with guest posting on each other’s business blogs. Don’t skimp on the quality and the design of your promotions. Now is the perfect time to bring to attention the awesomeness of your business through quality graphics. Plan your graphics in advance and present a cohesive brand design. Need some inspiration for your graphics? Check out some tips from Canva. A week leading up to Small Business Saturday, create a series of graphics for social media that communicates your business offering and personality. Show the side of your business that is authentic through creative visuals, videos and an energetic voice. Tell the story of your brand through Instagram and Facebook stories and offer up a behind the scene glimpse of the everyday life of a Small Business Owner. Be sure and use hashtags on all your social media outlets to boost your visibility. For a business owner, this is an opportunity to ride the marketing trend, and for a shopper, you’ll be able to follow what others are sharing. Consider holding an in-store event at your retail location, or partner up with another business. Offer refreshments, entertainment (such as a photo booth) and extra deals to guests. Make it fun! Support the local arts in your community. Do you have a brick and mortar location… and walls? Use your location to support and cross promote local artists and artisans, this can add a unique, encouraging and fun environment to get people into your location. Most enthusiastic shoppers appreciate the local and hand made goods that cannot be found in Big-box locations. Millennials have emerged as a driving force for small businesses. This generation likes convenience and supporting local, instant shopping gratification and a homegrown “giving back” experience. Not only do Millennials like to feel a connection to the products they buy, they appreciate a personalized shopping experience and customized products. Online shopping is expected to reach an all-time high and will soon exceed in-store shopping. Make sure your website loads quick, is updated and of course, mobile friendly. Once you have visitors to your website make sure that you have a way to encourage them to return. There are a variety of tools you can add to your website which can bring a personalized experience. One of our favorites is Hello Bar. Since 2008, Rosepapa Creative has helped numerous small business owners in the United States navigate the complexities of digital marketing. It’s a jungle out there! However through our experience, strategy, creative design and content, our digital solutions have worked seamlessly to help business owners scale to the next level. Middle-age Entrepreneurs Tend To Be More Successful Website Design Trends for 2019 – Staying Power Politics and your Brand – 3 Tips Before you Dive In!